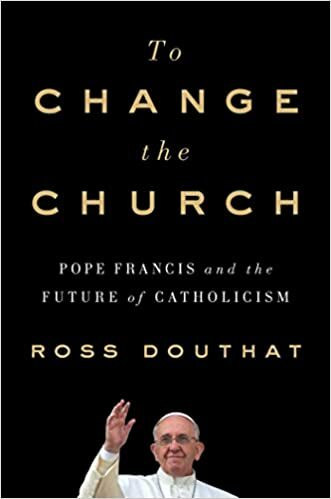 At Public Discourse, R.J. Snell (director of the Center on the University and Intellectual Life for the Witherspoon Institute in Princeton, NJ) looks at Ross Douthat’s recent book for the 5th anniversary of the pontificate of Pope Francis. If you haven’t read this yet, you are missing out on a fascinating, ongoing discussion. Of course, if the church was in error on communion for the divorced and remarried, it meant that the previous popes were in error, that previous councils were in error, that the English martyrs were in error, that not only the Church’s moral teachings but also her ecclesiology and sacramentology were wrong, and that there were no principled reasons to reject communion for cohabitating couples or sincere homosexual couples. That is, this was not a matter of pastoral accommodation but a revolution calling into doubt the very meaning and existence of the Roman Catholic Church. It also meant that untold millions of Catholics had struggled to resist sin, and to confess when they failed, for no reason. It had all been in vain, a ridiculous hang-up without cause. (One bishop even suggested that Jesus himself had been wrong and unmerciful to reject the Mosaic law permitting divorce.) …. So, what will be the Francis legacy? An exhausted but ultimately victorious orthodoxy? A swelling resurgence of traditionalists, especially among the young? (There is some evidence of this, certainly more than the supposed return of the lapsed and alienated Catholic.) Or will it be schism? A new theology, what Flannery O’Connor derided as “the Church of Christ without Christ”? Will it be the ascendancy of the African Church and the marginalization of the European, where it survives only because of full coffers? Will the old truce hold, or will it fail now that everyone realizes they kept the truce only because they felt their side would inevitably succeed? Good and serious Catholics sometimes welcome converts not with, “well, at last, you’ve found the true faith” but “come on in, the water’s terrible,” or “really, this old thing?” They confess their love more like a wife at her fiftieth anniversary than in the poetry of first love. The Church is all too human, all too dysfunctional, and has always been so. Yet, this ark, battered and leaky, survives and thrives. There’s a quiet sense that the Vatican thinks in centuries, that a thirty-year crisis will hardly matter in time. Or, perhaps this time is different. It feels different to many, as if something unprecedented and irreversible is happening. But we don’t know, and Douthat is honest enough to leave us hanging, waiting for the next installment of the Church’s story to be told. His story is unsatisfying in its ambiguity, but all the more interesting and truthful for it. This entry was posted in Pope Francis, REVIEWS, The Drill and tagged R.J. Snell, Ross Douthat. Bookmark the permalink. I’ve pondered the “wife at her fiftieth anniversary” sentiment myself from time to time. Like I fell in love with the Church in Her teachings and then in living with her feel like I’ve married an Alzheimers patient. I certainly haven’t seen too many of those in my personal, or larger, circle. Nope, the “Church of Mercy” seems to be just as emptying now as it was back in the baaad old days when we had the PanzerPope, y’know, the former Hitler Youth of liberal mythology. And all those “remarried” Catholics who were practically breaking down the doors to be readmitted to Communion (we could hear their cries of distress, we really could, awful, it was, I tells yiz, aaargh) ummm… well, they somehow don’t seem to have augmented the ever-declining numbers who come to our (large and highly money-draining) 19th century parish Church. What could be wrong? Must be punctiliousness. Or something. I don’t think so, really. It’s all happened before, right back to Athanasius and Arius in the 4th century. We’re always prone to be ensnared by what Chesterton called chronological snobbery. People who feel as if “something unprecedented” is happening usually have a limited grasp of history, and not enough imagination. The Arian heresy was pretty dreadful. The Protestant revolt was horrific and (500 years and irreversible so far (500 years and no end in sight). The Muslim heresy was, arguably, an even greater danger and did even more lasting damage. We may be up against something as bad, but “unprecedented”? Only in that the specific pathway is slightly new-ish. But remember that the saying “all heresies begin below the belt” is old; our modern adulterous affair with ummarried “love” is neither new nor special. San Francisco is (probably) still not even as bad as Sodom was. C.S. Lewis has the heroes in his space trilogy harp on the theme that “God never does anything the same way twice”, and whether it is true or not, evil certainly feels free to borrow from its play-book of the past. Irreversible? Nothing is irreversible until death. God can repair anything with grace. That being said, God doesn’t cure disorder by making evil actions not to have taken place. Evil actions remain evil and WILL have evil consequences, including further sin and suffering. If our popes and bishops go on appointing bad men and gravely inappropriate men as cardinals and bishops and priests, we WILL have ongoing evil in the Church. We cannot confidently predict how God will get us out of the current crisis, except that SOMEWHERE along the road we are going to have a pope that says: NO to the nonsense. How will we get there? We can only have guesses, but one thing is very, very probable: it will be due to good men and women, who are silent sufferers, praying for God to intervene. When will there be “enough” such good men and women? Only God can say when enough is enough. There is no earthly knowledge for that: it took 250 years for God to turn around the birth-pangs persecution of the early Church, but only 70 years to unravel Communist Russia. Ross Douthat is undoubtedly correct in that nobody can know how the crisis will unfold in the near term. It depends very critically on the Pope and the cardinals and their specific actions. Nobody could have predicted that Francis would point blank refuse to answer the 4 cardinals’ dubia on AL. He EASILY could have decided to answer them – which would have unfolded a different pathway to the crisis. Nobody could have predicted that Benedict would resign, and his remaining in office for only 3 more years might easily have required a completely different pathway for the crisis, possibly putting some other candidate in Peter’s Chair.